See the casinos on the side of this review, make sure you pick a Casino and deposit to get the Welcome Bonuses, and you are ready to go. Everyone should be familiar with the Wizard of Oz, which is a story based on a true novel by L. Frank Baum originally dating from 1939. It is about a girl named Dorothy who was teleported away to a fantasy world by a tornado, and that’s where the adventure starts. She becomes close friend with the Lion, Scarecrow and Tinman, which should ring a bell to you, no matter which generation you belong to. This was the main inspiration to create Wizard of Oz Slot. The awesome game comes from the workshop of WMS Gaming and sticks to the original story. 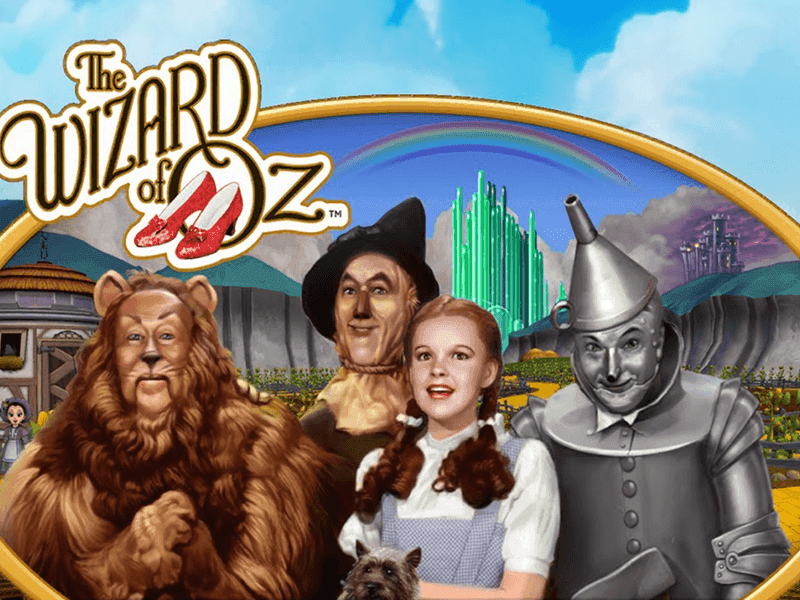 For a game that is created in 2013, Wizard of Oz Slot has something pretty awesome to offer. This game comes with a fantastic music that will most definitely take you back a few decades in the past. The screen might use a bit of improvement when we compare it to the slots nowadays, but there are a lot of options that you can adjust and use, and everything is well organized and easy to find. At the top of the slot game, you will see the logo of the game, while the whole bottom is with the adjustable options and features of the game. Here, you can see the Pay Table and the Auto Play as well as the Bet Max features. The adjustable options like bet, line, paytables and the magical spin button in the bottom right corner. The reels take a huge portion of the screen and the symbols are on a white background, while the whole slots, the background is a clear sky with few clouds here and there. All the symbols in the game are related to the theme, but unlike the rest of the slot games around that have their symbols divided into lower and higher valued ones. We can see the tornado, Dorothy’s house, a hot air balloon, her dog Toto, the Wicked Witch, the ruby slippers, her three companions and Dorothy herself. To make things more interesting and dynamic, the creators of this game decided to add a Wild Symbol which is represented by the logo of the game, and it will be used as a substitute to all the normal symbols that we just mentioned above. It will get in their winning combinations and award higher prizes when it does. The jackpot symbol is here to aid in the winning combinations as well, and the Scatter Symbol is the Emerald City which triggers the bonus feature of the game. The slot game offers a fantastic gameplay and you will see it from the very first spin that you take. Wizard of Oz slot has five reels and 30 paylines, which is more than the standard of 25 paylines, increasing your chances of a win. It’s pretty important to choose the casino where you will play the game for a number of reasons. You will spend most of your time playing the game on the pages of the casino, and they are pretty much responsible for your depositing and withdrawals. Check out the welcome bonuses of the casino as well as the players’ ratings of the same to draw a conclusion. You can even read our reviews for the casinos to have a detailed information. The denomination plays a pretty important role in the slot game, as that determines the value of the spin. 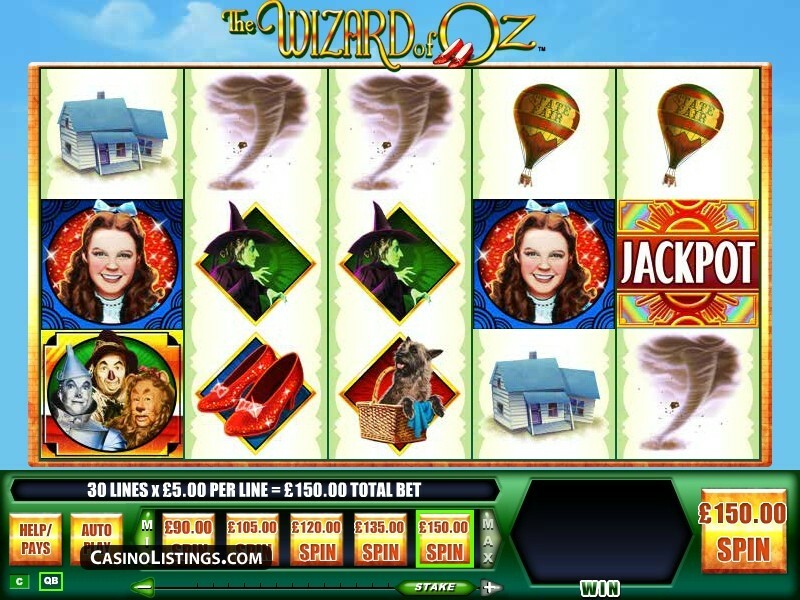 In Wizard of Oz slot, the denomination ranges from £0.01 up to £150.00 for a single spin. Although we have seen a lot higher denomination ranges, this will probably make all those players who are here for the adrenaline rush and want to play with the highest denomination pretty happy. The coin size determines the value of one coin, which is used for the denomination for each spin and for the winnings of the game. The coin size can go up to 25 in Wizard of Oz slot. The Max Win in this game is a coin multiplier of x50,000 which is a lot more than most of the online slot games that we have reviewed here. Don’t misread, as this will not multiply your win as many people think, but the coin size that you are playing with. The Bet Max is one of the two features available in the slot games. This feature sets the denomination, coin size and the level of the game all the way to the maximum while also activating all of the paylines that this game can offer. The Bet Max feature will make all the people who are here for the money and the excitement as well as the adrenaline rush pretty happy. This is a relatively good feature if you are lucky enough, but you have to be pretty careful and play with a plan or a limit to your cash, as it can lose all of your money in the blink of an eye. On the other hand, a much more relaxed option is the Auto Play feature. This feature gives your index finger a rest from clicking the Magical Spin button after every turn and sets the reels of the game spin automatically. All you need to do is to set the denomination and the number of auto spins that you want the game to spin for you. You can set the Auto Play to spin the following amount of times: 5,10, 15, 20, 25, 50, 100, 250, 500 and 1000. This is an awesome feature that allows you to be free from clicking the spin button, and you can do whatever you want, from making yourself a nice cup of tea to playing on the go or playing two games at the same time. Note that you can always cancel the feature if you want to go with the manual spinning again. Two Bonus Features round up the game – use them wisely and squeeze the most out of them! This is one minor bonus feature which activates itself randomly and you can’t do anything to trigger it. It will appear on the reels and turn one to five of the reels into an expanding wild. The player is awarded a cash prize depending on the symbol he manages to land on the screen. You’ll get eight free spins here and during this phase, if you can land a Winged Monkey Wild Feature symbol on reel three you’ll be asked to click anywhere on the screen. A number of winged monkeys will fly onto the screen and turn random symbols wild, giving you loads more winning combo chances. Check the video below for an example of this bonus game. In this game you initially get to pick one emerald from a selection available; you will either win a cash amount, a trip to ‘character land’ or a trip to the Emerald City. If you pick the character land you’ll head to the place associated with that character – Scarecrow Cornfield, Tin Man Apple Orchard, Cowardly Lion Dark Forest and Wicked Witch Castle. Here you select a gold charm to uncover either the character or a return to the Yellow Brick Road where you pick emeralds and the round is over. If a character (or more than one) has been found and you make it to the Emerald City you will win cash prizes depending on which character it is with Dorothy being the most valuable. 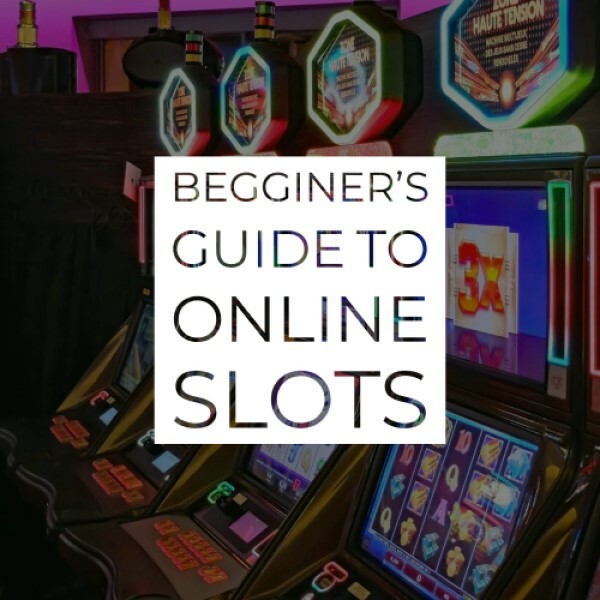 There are several tips that we would like you to know before playing the slot game, and these will most definitely aid you in the gameplay and preparing for the same. All the slot games have the same logic – the higher the denomination is, the more lucrative your wins will be. This is because all the wins in the slot games are awarded as multipliers, and your bet determines your win. We suggest you play with the as high denomination as you can to claim as lucrative wins as you can, although you should always consider the amount of cash you want to play with and come up with a plan before starting the game. The coin value also determines your outcome when a winning combination lands on the screen. You should play with your denomination, try higher or lower, depending on your budget, but you should always play with the maximum coin value. Although the Bet Max is one of the most exciting and rewarding features in the game, it may lose all of your money in the blink of an eye. In Wizard of Oz Slot, you are playing with £150.00 denomination for a single spin, which is actually not a small amount of money. If you decide to play this feature, come up with a plan or a limit to your cash and have money for at least 10 spins before trying the feature. This is the most relaxed feature in the slot, but so many things can go the wrong way when you try to play this feature. People usually totally forget about the game and play another slot, make their fav cup of tea or completely go afk and out of the house, and when they return, all of their wagered money is lost. Things can easily get out of control, and to prevent that, you need to constantly watch the game. If there are around five spins that aren’t landing any winning combination, try restarting your luck and start the feature again or continue manually. Sometimes, calling it a day is the best option when there are no winnings for a longer time. Since the mobile industry is growing every day and people visit and play the slot games from their pocket devices more than the PC or Lap Top nowadays, it’s pretty important for a game of the calibre of Wizard of Oz to be responsive for a mobile device. You can now play this awesome online slot game on your mobile, tablet or PC. Regardless of your operating system, you can use Android, iOS or Windows to play the game. Remember that the casino where you play the game also plays an important part in the mobile playing. The RTP is an abbreviation for Return to Player and it indicates the amount of cash returned to the players of Wizard of Oz over a longer period of time. This means that the higher the RTP is, the more it will return to the players, so you want to be playing slots with higher RTP. This is more than excellent, and you should definitely consider playing the Wizard of Oz. If you want to find out more about the RTP or want to see games with the highest RTP, check out our Detailed RTP Guide. There is nothing better than playing a slot game that ensures a quality gameplay and has lots of rewards waiting for the luckiest and bravest players. With five reels and 30 paylines, it offers a denomination range of £0.01 up to £150.00 where the maximum amount that you can win in the games is x50.000 coin multiplier. WMS Gaming is one of the best when it comes to creating awesome slots, with tons of interesting bonus features, and it’s your turn to check out Wizard of Oz Slot.